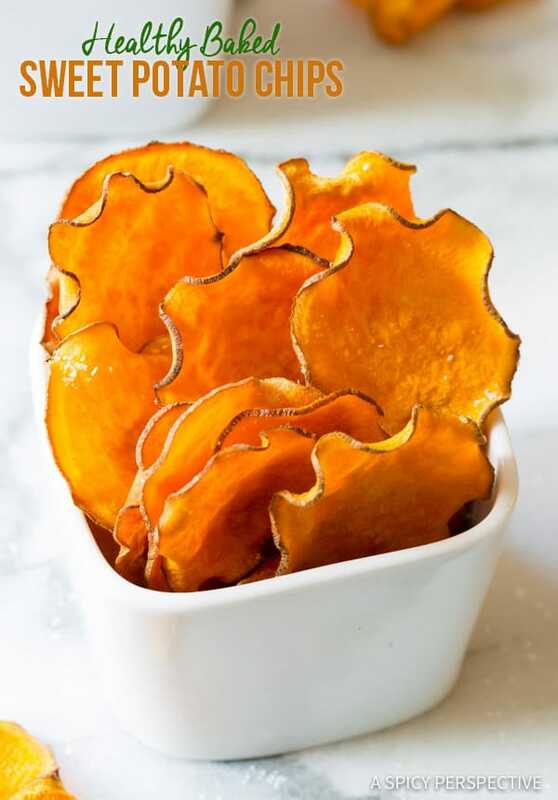 Simple healthy 3-ingredient Baked Sweet Potato Chips recipe, perfect for after-school snacks and spring picnic baskets! 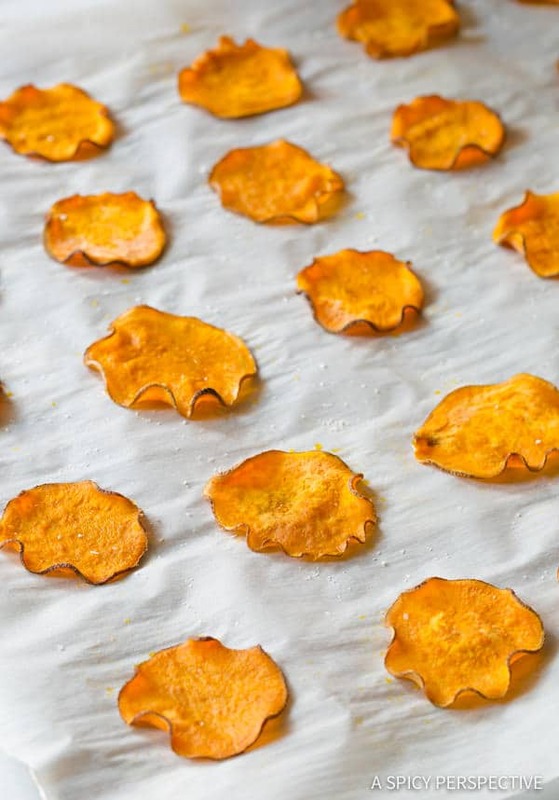 Bake Sweet Potato Chips at Home Instead of Buying Them at the Store. So today I’m sharing my Baked Sweet Potato Chips Recipe. It’s super simple to make, requires only 3 ingredients, and tastes like better than store bought chips, because they’re fresh! 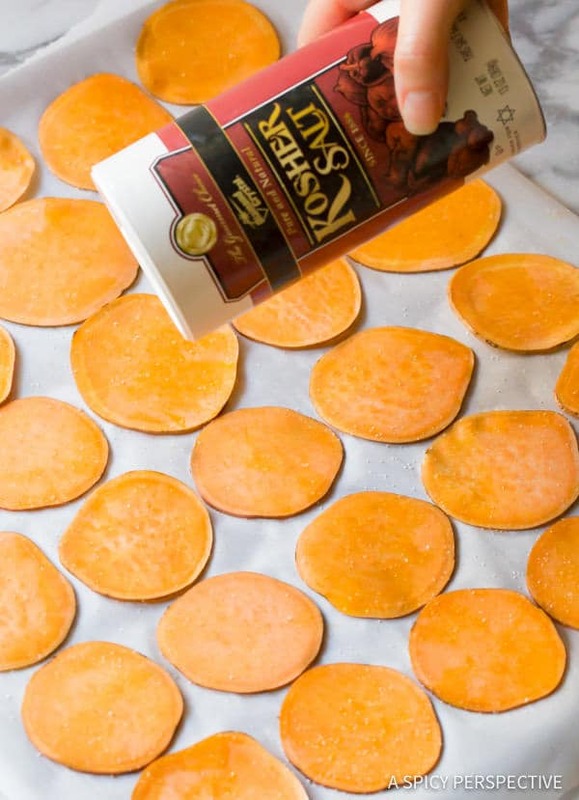 Plus, making sweet potato chips at home allows you full control of chip thickness, fat content, and seasoning. 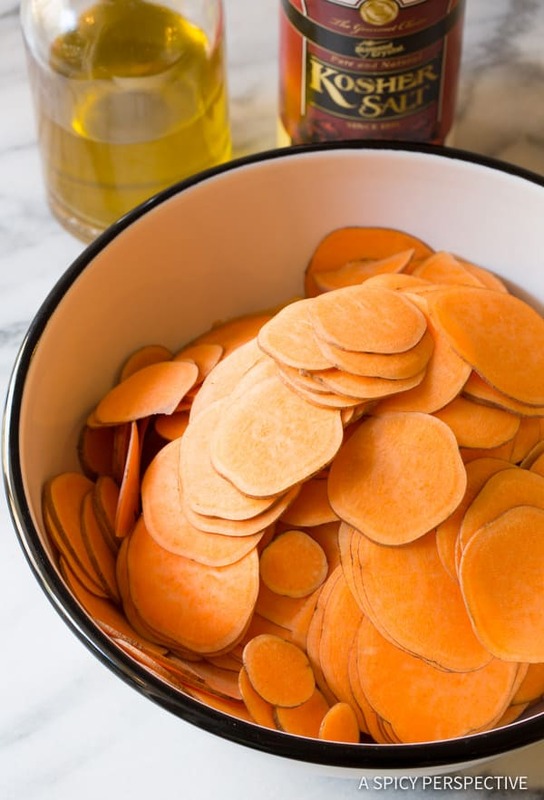 Place the sweet potato slices in a large bowl and drizzle olive oil over the top. Toss the slices with your hands to make sure every single slice is kissed with oil on both sides. 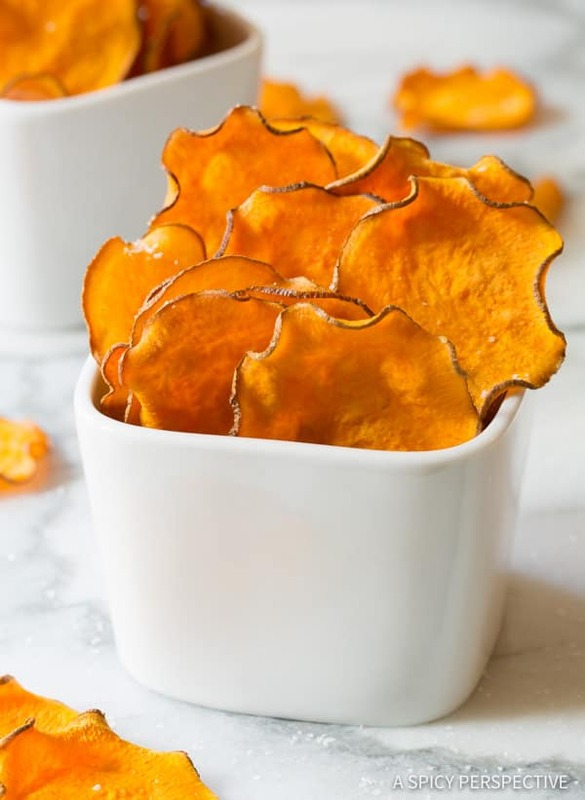 Imagine these gorgeous rusty-hued chips packed in Easter baskets, or serve on Easter as a simple side dish. Watch the Video & Check the Recipe Card for Full Instructions on How to Make Baked Sweet Potato Chips! Disclosure: This post is sponsored by Diamond Crystal® Salt. All opinions are my own. 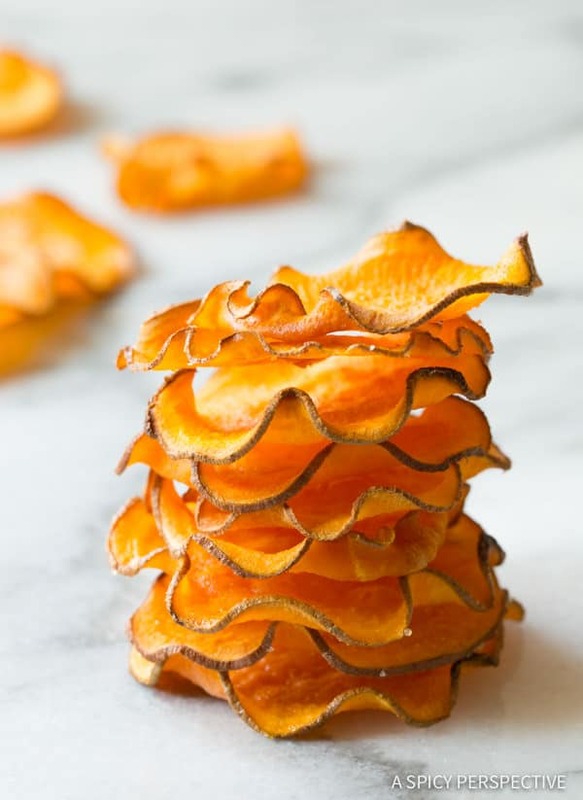 Baked Sweet Potato Chips Recipe - This simple 3-ingredient recipe makes a fabulous healthy snack and side dish. Didn’t work out for me at all. Thin slices got burnt after 10 minutes. Another set, slightly thicker, stayed soft, but got black burnt spots as well. Saying that, I would assume that the temperature should be lower, and time longer. Oh, possibly, more oil. Sorry to upset you, but that’s what i’ve got. 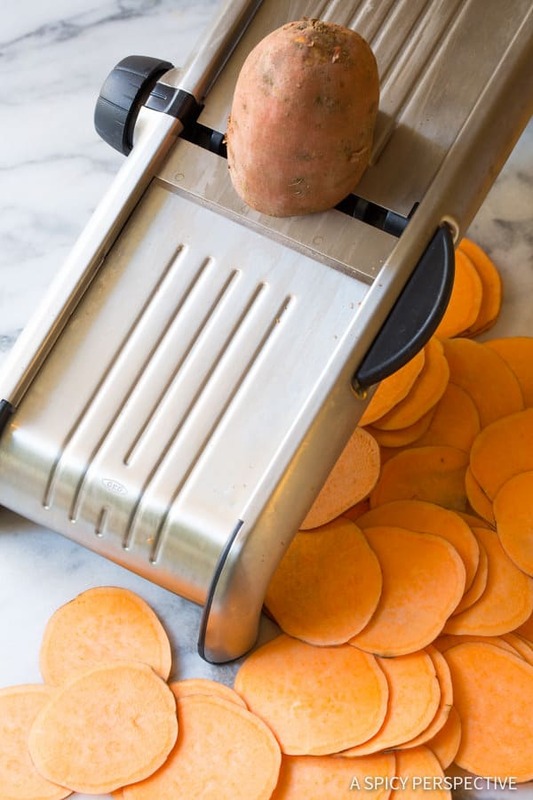 Which mandoline did you use for sweet potato? Sweet potato is hard veggie, so commercial grade mandoline i am looking to buy, please let me know your choice.. I have the stainless steel mandolin from OXO. I’m so sorry you had a bad experience! I will say I made a batch of this exact recipe this weekend and they turned out perfectly. I would suggest you buy an oven thermometer to hang off your oven rack to ensure an accurate read on the temperature. It’s VERY common for ovens to run too hot or too cool. My ovens are new and I still do this to try to make sure I’m giving the best recipe instructions. I even buy new thermometers every 6 months to keep them accurate. Also, your oven could have hot spots… If you think this might be an issue, try making these with the convect setting to circulate the air in the oven. I wish I had read all of these comments before making this snack. I was so excited and used our last sweet potato and even though I followed the directions to the letter, at 20 min. they were burnt to a crisp. I am so disappointed. I find it hard to believe that all of us have defective ovens. I may try again another time but will be following the other commenters directions and do it at 300*. I followed the recipe to the letter and it didn’t work for me. 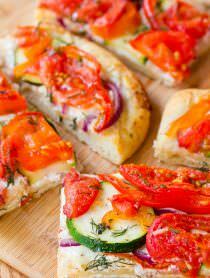 I used my mandoline to get thin slices, exactly like in the photo. Tossed in olive oil and made sure all were thoroughly coated. Put slices so they didn’t overlap, on parchment paper. First batch went into a 400 degree regular oven (an independent oven thermometer confirmed temp.) Each chip ended up burnt on one half and the other half was still soft before the 20 minutes were up. Had leftover slices for a 2nd batch so this time went to 350 degrees. At 20 minutes they were still soft so went a couple more minutes while watching them. Went they started burning along one edge, took them out but they were still limp. Only only thing crispy were the burnt parts. Never curled or crisped up like in the photo. Don’t know how you got them that way. These are staple in our house! I love how crispy they get! So thin, crispy and delicious! I loved this! Such a healthy and easy to make snack! A nice change from sweet potato fries! They were delicious!! The mandolin makes all the difference, thin is best! Several sweet potatoes and some good olive oil down the drain, I’ve deduced that no functioning oven in the world could produce these results. 400 degrees: burnt garbage by minute 12. 350 degrees: burnt garbage at around minute 16. 300 degrees seems to be the sweet spot, at a little over 20 minutes – not burnt garbage. I watched them like a hawk, and set a stop watch. Another note – a baking rack on top of a baking sheet works better, not parchment paper. One side would burn more if I didn’t. I used a mandolin on the thinnest setting, as stated. 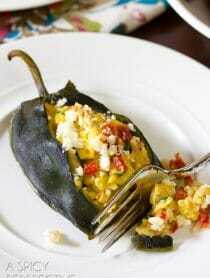 These are incredibly delicate and cook extremely fast. If you go by the recipe – dump them in a bowl and toss to coat the olive oil – you get very uneven results in the same batch. A careful coating with an olive oil spray bottle would be incredibly helpful. Also, you have to be sure to get discs of the same size in the same batch. Unless my oven, and several other commenters ovens are actually crematorium ovens, I don’t see how the temps could be so off. Even if they run hot, lowering it by 100 degrees was the only way to get results. If you have wayyyyyyy more time to dedicate to this, these might be something I make more often. But it’s not as easy as this recipe makes them sound. Thank you so much! Your comment was so VERY helpful!!! I eat Potato chips every single day! Love the richness and creaminess of this wonder fruit 🙂 Had only savoury version before, but it was long time ago. I made the sweet potato chips last night and they were great. I waited till they cooled and we ate a bunch then put them in a plastic bag. When I went to get some today they were all soggy. How can I keep them crispy??? This sounds so easy and fun to try! Thank you for sharing the recipe! I will definitely try it! I forgot parchment paper, can I use foil? Yes, you can! You may just have to blot them a bit at the end, because parchment absorbs some of the moisture. My kids like sweet potato chips. I do not have a mandolin slicer. No, I am not going to run right out and buy one either just for this . 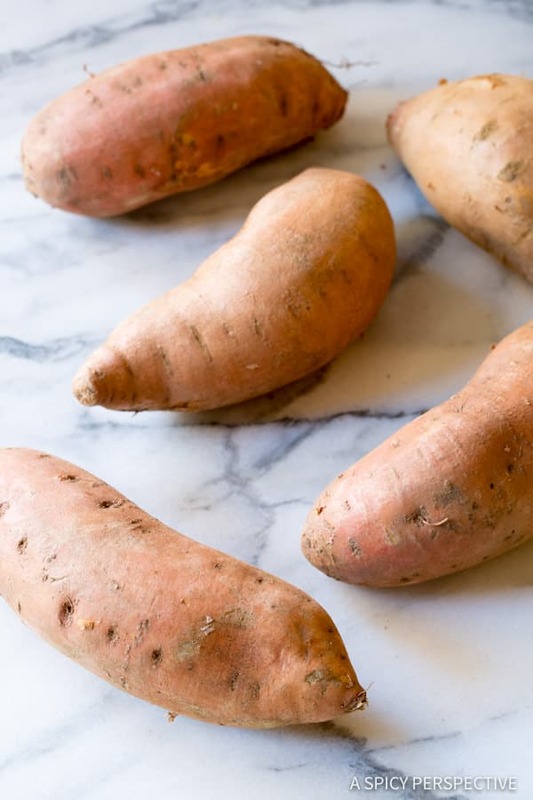 will do the trick with these sweet potatoes. so that is what I am going to use to slice the sweet potatoes. and I do not have several baking sheets, I only have a few. I had these at a friend’s house and they were delicious. I tried making them and they burned after 10 minutes. Any suggestions? Oh no! How thin did you cut the sweet potatoes? That might effect the outcome. You might also want to check your oven’s accuracy with an added oven thermometer. Hello from Australia! Just wondering if you’ve tried making your sweet potato or beetroot chops using oil spray, rather than oil? Sorry – chips, not chops! I have done that in the past and it works really well. The only problem is you usually find all sorts of added chemicals in oil sprays… At least in the US. Is it ok to bake 2 trays at the same time? Do they get the crispy texture? For some reason most of mine got burnt before the 20min was up! Did I do something wrong? Help! Oh no! Maybe your oven runs a little hot? THANK YOU for putting the nutrition label! Now I can actually TRY this recipe because I know how many calories. Pingback: 13 Low Carb Paleo Snack Recipes You’ll Actually Crave — PALEO? NO PROBLEM! These look AWESOME! When I make veggie chips, I store them in the fridge and they lose their crispness. How do you store your veggie chips? I tried this recipe tonight and followed it to the letter and they came out burned on half of the chip and almost a normal color on the other half (same side of the chip, not top side and bottom). Have you experienced this? What did you do to remedy it? Oh no! I’m sorry to hear that. Two things come to mind… Did you use parchment paper on your baking sheets? It really does help even out the cooking. Second, you may need to get an oven thermometer to hang from your oven rack. It sounds like your oven may run a little hot. Do you peel the potatoes? Curled edges look that way. Thanks! Can you do this with other vegetables, i.e. zucchini? Would I still bake at 400 for 20-25 mins? 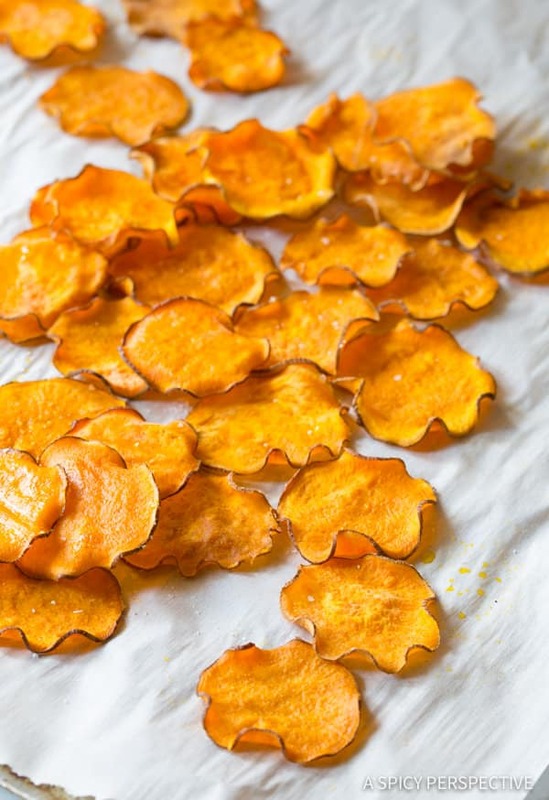 We love sweet potato chips in our house – crispy right ouf the oven is best!! My family would love to snack on these! I will be trying these really soon! Those sweet potato chips look so nice and crispy and good! Cumin and a dash of cayenne for me! I tried it once in store-bought chips and replicated it at home, now I can’t get enough! I used the cumin and a little red pepper.. When I tried baked sweet potatoes I didn’t like them much. I think they were too sweet to my liking lol! But this is something that looks like my cup of tea – tiny chips I can handle, I think :) They looks absolutely perfect to me! Thanks for the inspiration! 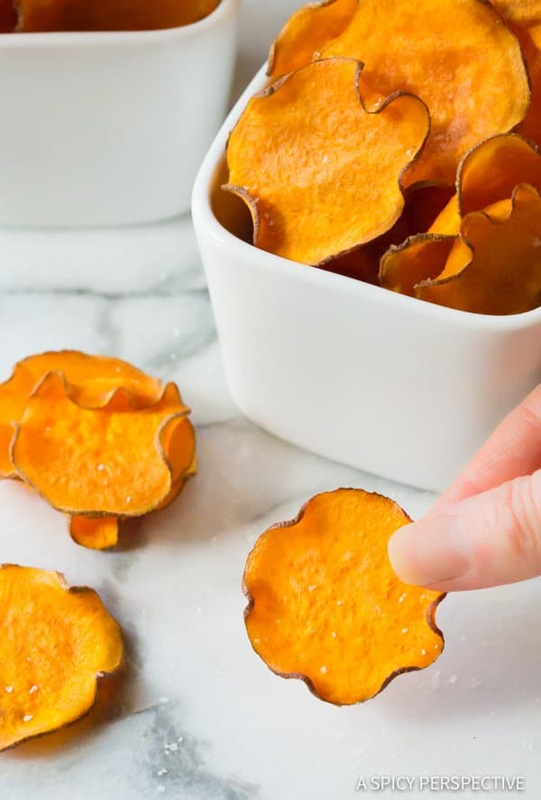 I love snacks so I will try make these chips! 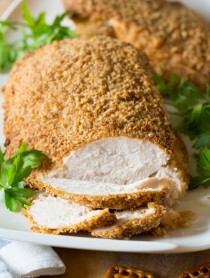 I sprinkle some curry powder or chilli powder on mine before baking for an extra kick. Favorite thing ever. I love sweet potatoes and having them in chip form. Yum, yum!